IRVINE, California, August 24, 2010 (ENS) – A major earthquake on the San Andreas fault northwest of Los Angeles is likely to happen “soon” warn scientists who have charted quakes there dating back 700 years. In a study of historic seismic activity along the fault, researchers with the University of California-Irvine and Arizona State University found that large ruptures have occurred on the Carrizo Plain partion of the fault, about 100 miles northwest of Los Angeles, as often as every 45 to 144 years. The accepted scientific wisdom has predicted major earthquakes along this part of the San Andreas fault every 250 to 450 years. The new study found big quakes occurred much more often – every 88 years, on average. The last major earthquake was the magnitude 7.8 Fort Tejon quake in 1857, more than 150 years ago. 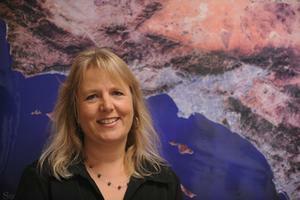 “If you’re waiting for somebody to tell you when we’re close to the next San Andreas earthquake, just look at the data,” said UCI seismologist Lisa Grant Ludwig, an associate professor of public health who is principal investigator on the study. Not all the six earthquakes studied were as strong as originally thought, but they all were big quakes, ranging in magnitude from 6.5 to 7.9. Sinan Akciz, UCI assistant project scientist and the study’s lead author, was part of a team that collected charcoal samples from trenches they dug in the Carrizo Plain. The study is based on analysis of these samples along with earlier samples that Ludwig had stored for decades in her garage. The charcoal forms naturally after wildfires, then is washed into the plain by rains, building up over the centuries in layers that are fragmented during earthquakes. Akciz dated the samples using recently developed radiocarbon techniques to determine time frames for six major earthquakes, the earliest occurring about 1300 A.D. The scientists will publish their study in the September 1 issue of the journal “Geology.” Funding for the study was provided by the National Science Foundation, U.S. Geological Survey and Southern California Earthquake Center. Ken Hudnut, a geophysicist with the U.S. Geological Survey, said the research is important because it revises long-standing concepts about well-spaced, extremely strong quakes on the 810-mile fault. For individuals, preparation means having ample water and other supplies on hand, safeguarding possessions in advance, and establishing family emergency plans. For regulators, Ludwig advocates new policies requiring earthquake risk signs on unsafe buildings and forcing inspectors in home-sale transactions to disclose degrees of earthquake risk.